Liran Harsgor is a Postdoctoral Fellow in the Munk School of Global Affairs and Public Policy and the Department of Political Science, University of Toronto. Her main research interests are political behaviour, public opinion and electoral politics. 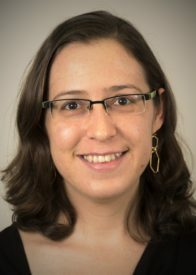 Liran completed her PhD in the Department of Political Science at the Hebrew University of Jerusalem in 2017. Her doctoral dissertation focused on formative experiences and generational differences in political attitudes. In the past seven years, Liran has been part of a comparative research project, led by Professor Orit Kader and funded by the European Research Council, which examines how electoral districts affect representation and party systems, focusing on district magnitude as the main explanatory factor. Kedar, Orit, Liran Harsgor and Raz A. Sheinerman. 2016. “Are Voters Equal Under Proportional Representation?” American Journal of Political Science, 60(3): 676-691. Harsgor, Liran and Raz A. Eizenberg. 2017. “Apples and Oranges: Putting Electoral Thresholds in Context”. In The Elections in Israel 2015, Gideon Rahat and Michal Shamir (eds. ), New Brunswick: Transaction Publishers, 47-69.